Inspiring Art Teachers to Explore Art History | Curator’s Corner: Art History Survey, A New Slant, No. 4: What Was Happening in the 1400s/1500s? Art History Survey, A New Slant, No. 4: What Was Happening in the 1400s/1500s? One of the bonuses of studying art history is learning about surprising connections when studying how cultures in the past interacted. Many times such interaction between cultures and the influence it has on the arts is overlooked. This is especially true in non-western cultures, when these cultural interactions don’t precipitate the emergence of massive empires that racked up wealth at the expense of numerous conquered peoples, and then glorified themselves in fabulous art and architecture. I find Indigenous cultures that steadfastly, and often quietly, grew in cultural and material wealth from their survival skills (such as farming rich land) and trade far more interesting. Although the exact date is not known, some archaeologists agree that the first Homo sapiens set foot on the North American continent between 15,000 and 20,000 years ago. The period was known as the Pleistocene Era. At that time, the Northern Hemisphere was experiencing the Ice Age. The glaciers that dominated the continent lowered the oceans by about 100 meters, which exposed a strip of land that connects Alaska with Asia. Most scientists believe that it was over this strip of land that First Nations migrated to the North American continent. In recent years, however, scholars have been examining other scientific clues, such as carbon dating of prehistoric relics and the linguistic development of Native peoples. This research has led some scientists to hypothesize that the earliest waves of migration to North America may actually have taken place more than 20,000 or 30,000 years ago. The hypothesis goes on to suggest that these people came by water. The Mississippian cultures, which flourished from 900 through 1700 CE, descended from the so-called “mound-builder” cultures of the late prehistoric period. The Mound Builders constructed mound lodgings and burial chambers of pounded earth with thatch roofs. The Mississippian cultures included the Chickasaw, Cherokee, Chicamauga, Chisea, and Shawnee bands. The earliest report of European contact with these cultures indicates that the cultures built their towns on the mound foundations left by their ancestors. The Mississippian cultures were primarily farmers who raised vegetables, tobacco, and corn. The Mississippian cultures had an extensive trade network by land and via the Tennessee and Mississippi Rivers that extended from the Great Lakes to the Gulf of Mexico, and from the Mississippi River to the Atlantic Ocean. 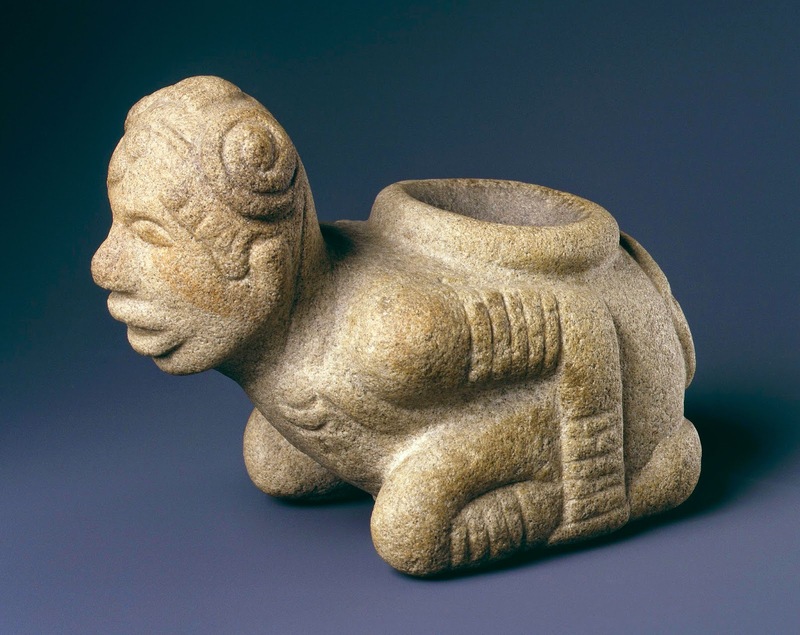 Although no actual Mexican artifacts have been found at Mississippian sites, artistic evidence exists of contact with the Mesoamerican Mexican cultures, especially in ceramics, sculpture, and architecture. Mississippian society was also stratified like Mesoamerican cultures, in which there was a hierarchy of priest/rulers, noble families, and a warrior class. Some of the greatest Mississippian artworks are ceramic. They are renowned especially for their utilitarian works, which include effigy vessels reminiscent of Mexican cultures and figures representing a variety of ages and positions within society. The bright reddish pigment of this vessel is particularly identified with works from the region of present-day Arkansas. 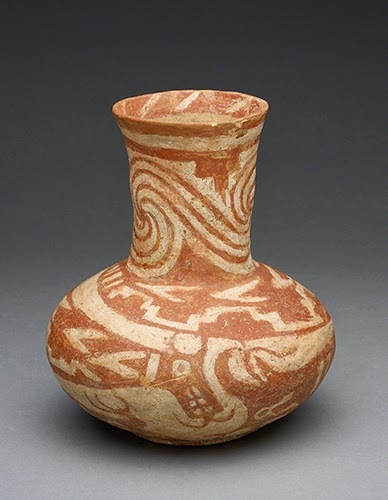 While the step and wave patterns may remind us of other North American cultures’ ceramic vessels, the serpent decoration ultimately has similarities to Mesoamerican ceramic decoration. Unlike Mesoamerican ceramics, however, the vessel is not decorated with as strict organization of registers. Such vessels would have been funerary objects containing necessary items for the deceased’s afterlife. There is further similarity to Mesoamerican art in renderings of human beings. This type of rendering is noticeably absent (other than in abstracted form) from Plains, Woodlands, Pueblo, and California art. In addition to pipes and vessels, they also appear on pot handles and lids. Another theory is that, like the Mesoamerican culture that influenced them, the Mississippian peoples had special societies that honored warriors. The submissive pose of this figure is a common characteristic of these sculptures and may represent part of a ritual dance performed in these warrior guilds. The simplification of form, which includes the flattened pyramidal nose, is also an element of Mesoamerican influence. 1368–1644 Ming Dynasty in China, a period when landscape painting and refinement of porcelain reached the highest peak of achievement. 1392–1573 The Muromachi, or Ashikaga period in Japan, a turbulent time during which Zen Buddhism began to assert (what would be) a lasting influence on Japanese art. 1400–1435 End of the Palaelogue Renaissance, the last flourishing of Byzantine art, and conquest of Byzantine Empire by Turkey in 1435. 1413–1451 and 1451–1526 The last two dynasties of the Delhi Sultanate, a period during which illuminated manuscripts began to be produced lauding the deeds of the Islamic rulers of India. 1438–1534 The rise and fall of the Inca Empire in Peru, a culture that produced magnificent architecture, ceramic art, textiles, and metal art work.